EOS Authority - Verify EOS Registration - EOS block production. Monitor EOS activity, setup account alerts. Fill in your ethereum wallet address or your EOS account name or even your EOS public key to view your account details on the EOS Mainnet. Polls and referendum are a cornerstone of EOS. As a community, we are now able to provide change the direction EOS takes. 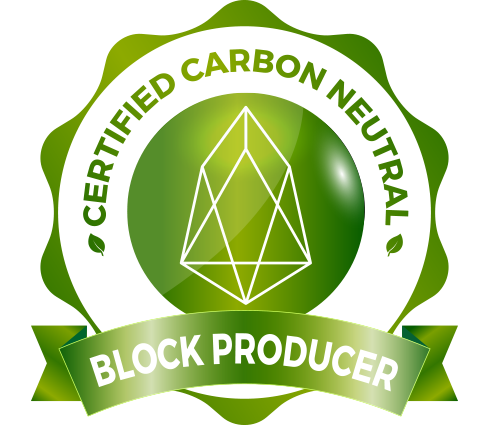 Together we have made EOS the world’s first carbon neutral blockchain. The future of blockchain is sustainable. Shows a list of proposals presented to BPs for voting. 15 BPs can approve a proposal and the change will go live on the mainnet. We identified an issue that could have caused $10 million of EOS being stolen by hackers. We quickly alerted the Block one team to roll out a code fix! On launch, each EOS account holder will be assigned an account name. You will need your account name to make transfers or develop interesting Dapps. Access all EOS functionality: Make transfers, manage delegration, staking resources, RAM, vote for block producers and more. This is the landing page for all types of voting analysis. We have total supply, actual votes in effect and total staked. We put together an amazing proof of concept to show how fast EOS actually is! With EOS block speeds of 500ms, a game controller could be on EOS. Voting on EOS can be delegated to a proxy. These proxy accounts then vote on behalf of the accounts that pass the voting power to the proxy. All about REX on EOS. Track REX status and progress with REX development on EOS. This page shows ranking of all the producers. Along with the current rankings, it also shows the total number of voters and EOS per vote along with overall voting percentage. Analyse voting patterns of users. This includes averages, median and total votes. This system also tracks exclusive votes where there is just one vote for a BP. Read about how half million worth of EOS tokens were returned to a single unregistered token holder. Select any two block producers from the lists given in the page to compare voting patterns (actual votes and number of voters) among the block producers. The data that needs to exist even when the smart contract ends is stored in a "table". It is managed using the Persistence API. All the tables are public information. EOS Authority and its team members will support and defend the EOS Constitution. We defend the rights of the EOS Community and the token holders. Registration is an important step ahead of the mainnet launch. Most of the EOS are in wallets that have not yet been registered. Please spread the word! The watcher plugin is useful to watch for specific actions on the chain and then send them to an HTTP end-point as soon as the action is seen on the chain! Open source code available on Github. This is the first set of Top 21 block producers elected by the community and appointed on the very first schedule on 14th June 2018. EOS private key generator on your browser. Use your browser offline and create as many private keys as required. If you haven't registered or if your registration was invalid you will need a fallback private key to use your EOS on the mainnet. Explained here. This voting tool powered with Scatter, lets users vote for EOS Authority. You can also select from other Block Producers. Your vote is important. How was the EOS mainnet launched? The launch of EOS will hopefully be a milestone in the history of crypto. We were right in the middle of it all. We have a timeline of events. Our logo and banners for use on places after you get permission to use them. Also include other media items. The problem with missing memos or incorrect memos is resolved with smart open source contract code. This is a network graph which shows how the large token holders vote and the Block Producers they vote for. Only the top 30 block producers are shown on this chart. A fraction of the EOS tokens however did not have fallback apply about 3.3 million EOS and 19,587 wallets. These tokens were stuck!... well, until now. This ranking is based on the number of actual blocks produced since the launch of the EOS Mainnet. The system tracks the number of blocks produced by each BP. Several premium names have been bought via the namebids system. These premium names have been popular with token holders. Track popular names. This page helps track total producer earnings. It breaks down earnings into Voter Pay and Block Pay to give you more detailed information. Here is a list of ECAF orders that EOS block producers have complied to. This includes blacklists and account freezes. These are the largest accounts holding EOS. They include large exchanges and internal EOS accounts. Types of badges associated with an eos account. There are several types of badges associated with an EOS account. These badges highlight something special about the account. There are several types of transactions that appear on an EOS account. Some of the transactions on your account appear because you initiated them (or someone with access to your keys). This page helps the user to create an eos account using their existing ethereum address. This shows voting over a period of time, it has line charts tracking changes to votes and bar charts showing what the votes are comprised of. Your votes decay every second! Use this page to see how much has decayed so far. Enter an account name to find out its effective vote. Similar to how Netflix or Amazon recommends movies to you based on related movies. We aim to show which other Block Producers are likely to be voted for when you pick a certain BP. What to do if you are an unregistered token holder. A tiny fraction of the Supply balance 0.3% to be exact did not complete registration, nor did they have fallback applied to them. If you lost your genesis keys, we have an automated recovery solution using your Ethereum keys. If you are among the unforunate who saved your EOS private key somewhere but can't find it, we have an idea worth trying. A list of all genesis accounts that have been successfully registered and not used. Developed to help with the Lost EOS Key situation. Compare voting patterns over daily and hourly basis. Click on a cell to view which Block Producer lost or gained votes in a specific period and which voter changed the votes. List of the top 200 voters on the system. Also filter by a Block Producer to see the top 200 voters for that BP on this page. We have been testing REX for a month now. Here is what we have learned from the review of the REX codebase. Results from our second full code review. Here is what we have learned from the review of the REX codebase. Results from our third full code review. This was the best REX version so far, we didn't find any show stopping issues. The first stable version of REX has been released. We have commenced our final tests ahead of deployment to the EOS Mainnet. All REX tests by EOS Authority are now complete. We have now proposed setting up REX on the EOS Mainnet. Moving EOS from an exchange to your own account on the EOS Mainnet. EOS Authority deals professionally with technical matters or issues of arbitration & governance. Join us in shaping the platform of the future. What can you build on the fastest blockchain ever? With 500 millisecond block time, EOS becomes one of the fastest blockchains. How about playing an all time favourite action game? Elaborate Proof of concept services to showcase the technical viability of a product and its market potential. Design, development, audit, and optimisation of self-executing coded business contracts to automate processes. Improve transparency and traceability and reduce administrative costs with effective supply chain solutions. Have an exciting EOS blockchain project you like our help with? We have a growing an in-house team of EOS developers. We provide a range of consultancy services from development to security audit. Need help with your EOS registration and moving to the mainnet? We have already helped several thousand users make sure they have completed the necessary steps to move to mainnet. We would love to hear from you and help with all things EOS!